Say “centerpiece” and you probably picture a fancy flower arrangement, right? But with an eye for the unique and innovative, you can now opt for non-floral centerpieces for your wedding event. These offer wider decor possibilities than traditional arrangements, plus—without the cost of fresh flowers—they are great budget-stretchers as well. How to start? Consider anchoring your centerpiece on the theme, color palette, location, or season of the party. Also visualize the size and shape of the table you’ll be decorating. This can help you determine how simple or complex your centerpiece should be. Beyond that, simply let your imagination soar. The out-of-the-box centerpiece ideas that follow show just how out-of-the-vase you can go! Fuchsia, burnt orange, red, and aqua happily vie for attention in this towering centerpiece. How to make it? Simply fill heart-shaped woven boxes with edible guest favors, wrap each one in a colorful organza wrap, and stack the boxes up in a bowl or basket. 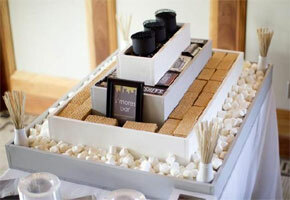 An eye-catching focal point indeed for a favor presentation table. Here, the table elements do double-duty so charmingly, you won’t even miss the usual floral arrangement. Have large glass vases serve as luminaries, wrapped in natural-colored raffia; and tuck yellow table napkins and olive fabric into wine glasses to mimic pretty blossoms. The final effect: a centerpiece look…without an actual centerpiece! You can almost hear the mariachi music, with this striking Mexican-themed table display. The idea is to let thematic elements take center stage on the table. Here, they’re globe-shaped take-offs on traditional piñatas flanked by oversized sombreros and colorful fabric wrapped boxes. With many party themes like this one, floral centerpieces wouldn’t have quite the same visual impact. Let paper-wrapped table lanterns take the place of a traditional centerpiece for an Arabian Nights-inspired display. Arrange them “table runner” style between the place settings, and allow the glow of the candles within to highlight the cutout symbols and gold-foil trimming of each lantern. Exotic indeed! 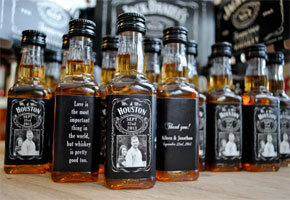 If it’s a conversation piece you want, plan something truly unusual to catch your guests’ attention. 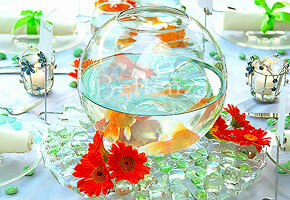 Surprise them with a live centerpiece, for instance, like this grouping of miniature fishbowls, each with a goldfish swimming inside it. These can then be taken home as guest favors at the end of the party (maybe with a starter packet of fish food to ensure proper home care!). Since food will figure prominently on your table anyway, why not present it so appealingly that it becomes your edible centerpiece? 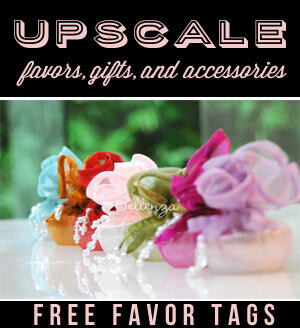 Lay out the goodies on the prettiest plates and position them atop urn-shaped stands to add height to the display. And all right, if you’ll really miss the flowers, set out petite pots of fabric roses for that feminine touch. Have innovative centerpiece ideas of your own? We’d love to see them…and so would our other Bellenza readers! For idea #2 how do you get the rafia to stick to the candle holders…do you tie it in a bow? or do you glue it? I have very interested in using this idea for my beach wedding. The raffia strings were tied very tightly around the glass vases. In this way, you don’t have to use glue. I would love to see photos of wrapped box centerpeices? I have a ton of boxes, and a ton of fun bright wrapping paper, but I don’t know how to arrange the boxes on the table. The table is rectangular (8×5 feet) and will seat 12. It’s a Charity Dinner that is sort of a competition although people pretend that it isn’t! I’m in! Depending on the size and shape of the boxes, the most logical way to do this is to stack the boxes in some circular fashion, so that the arrangement won’t look as if it is towering on the entire table. But since you have a rectangular table, what you can do is to create three to four separate arrangements in varying heights with the highest one at the center. Another option and this all depends on the boxes themselves is to arrange them in some sort of table runner fashion. This could either be in a straight line or even in an S or zigzag fashion. I LOVE the fish idea, this was my original idea for my centerpieces but FH didn’t think it was a good one. After seeing the fish bowls though along with the individual ones I may have to reconsider. Hi…I was at a very expensive wedding,(6 figure wedding).!! !They had goldfish by the multitude in orand and white with white orchids. Your jaw just dropped to the floor omg. It was amazing!! !Talk about a good conversation piece. I am actually incorporating black and gold goldfish into my daughter’s candy buffet they’ll be striking. actually the GOLDFISH trend hasn’t really hit but I can see it coming in the near future. I have the #5 centerpieces with the big. My question is, what size fish bowl did you use? Sorry, my “happy fingers” got away with me. My daughter likes #5 centerpiece with the fish and we are wanting to know what size is the fish bowl or where did you get it from. Thank you so much in advance in answering our questions. You really make it seem so easy with your presentation but I find this matter to be actually something that I think I would never understand. It seems too complex and extremely broad for me. I’m looking forward for your next post, I will try to get the hang of it! thanks. Thanks for stopping by, Shauna! Do hope you continue to enjoy our future posts. Love the one with the fish bowl. Great choice:) Stopping in from Domestically Speaking. Thanks for sharing!! Hi Dawn! So glad that you liked our centerpiece idea. We enjoyed joining your spring link party. Are you having another one soon?